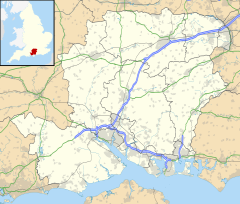 Sinah is the area at the southwestern end of Hayling Island. It incorporates the Ferrypoint, Sinah Beach, The Kench, Sinah Warren, and Sinah Common. It is bounded to the east by West Town. Langstone Harbour and its entrance form the north and west borders, and to the south is Hayling Bay. Monks had settled in the Sinah Warren by the 15th century. Fishermen's huts were present in the shelter of the Kench by the 19th century. The Norkfolk Inn, precursor to the Ferry Boat Inn, was created to serve the needs of the fishermen. Around 1900 Sandeman[clarification needed] set out to extend a road out to the ferrypoint for the Hayling Island Steamboat enterprise. While that enterprise failed the road did assist subsequent development of the Hayland Island Ferry, golf course, health farm and the war effort for the Second World War. In recent years land use of Sinah has stabilised with various areas being designated nature reserves. The Ferry Point is at the westernmost tip of Hayling Island in Hampshire, England, overlooking the fast tides of Langstone Harbour entrance. It was previously known as Sinah Point. The current at the Ferry Point is extremely treacherous and has claimed many lives over the years. There is a small cluster of houses and a pub, the "Ferry Boat Inn" (originally the Duke of Norfolk). Continuing directly past the put leads to a slipway directly into the water. A fork to the left leads past the base of the Langstone Harbour Master to the jetty for the passenger ferry to Eastney in Portsmouth. The Hayling Island golf course backs on to the point and the Kench (a small bay) lies just eastward. A single lane leads east toward the rest of the island. There are good views north to Portsdown Hill and Butser Hill. Sinah Beach extends from the Ferry Boat Inn at the western end of Hayling Island. Sinah Common is the area to the south of Ferry Road incorporating the Golf course. The area is now a Site of Special Scientific Interest. The area of water in front of the clubhouse is seemingly nowadays referred to as Sinah Lake although an area within Langstone Harbour that forms a lake at low tide is also known as Sinah Lake. Elements of World War 2 gun batteries and pill boxes are well preserved in this area. The Kench is a small natural inlet to the north of Ferry Road. Proposals to change this into a commercial port or marina foundered or were thwarted, and the area is now a designated nature reserve with a handful of houseboats permitted. The inn was known previously by various titles: as the "Norfolk Inn", "Norfolk Lodge (Inn)", "Hayling Ferry Tavern", and the "Duke of Norfolk". The original Norfolk Inn was present before 1776, built to the east of The Kench on the north side of the ferry point. The replacement building at the ferry point, south of Ferry Road, was built from the wreck of HMS Impregnable which sunk in 1799. The current building to the north of ferry[clarification needed] was originally where the boathouse stood. Members of the Spraggs family were licensees and owners from at least 1900 until after the mid-twentieth century and were responsible for the "Ferry" rebranding. The Spraggs were also responsible for operation of Hayling Ferry and there was an undoubtable synergy between the two enterprises. The establishment is no longer a freehouse, having been sold to Stonegate Pub Company, and is variously branded "Ferryboat" both with and without a space. The Hayling Ferry links to Portsmouth from the Ferry Point, and has been running for more than 200 years. In March 2015, the service shut down when the Hayling Island Ferry company went into administration after safety problems and repeated fines for carrying too many passengers at once. Service resumed in August 2016 after a fundraising effort which included a £5,000 donation from Richard Branson. Bus services to the ferry ceased in 2004. Efforts to re-instate the service have taken place at various times and the next proposal is to be 15 April 2017. ^ a b Walker, Karen (2012-04-01). "A history of Hayling Island holiday camps". University of the 3rd age. Retrieved 2017-04-10. ^ a b c Pullen, Dorothy (2007). "A brief history of The Kench". University of the 3rd age. Retrieved 2017-04-10. ^ "Langstone Harbour Management Plan" (PDF). Langstone Harbour Board. 1997. Retrieved 2017-04-10. ^ "HAYLING ISLAND Life and Times 1914-1919" (PDF). University of the 3rd Age. 2014. p. 5. Retrieved 2017-04-10. ^ Brown, Ron. When It Was Just Fields - The Story of Hayling Island. milestone. p. 37. ISBN 0903852179. ^ "Contact Langstone Harbour". Langstone Harbour Board. Retrieved 2017-04-10. ^ "Flora & Fauna". Hayling Golf Club. Retrieved 2017-04-10. ^ "Sinah Common HAA Site". Pillbox Study Group. Retrieved 2017-04-10. ^ "The Kench". The Hayling Site. Retrieved 2017-04-10. ^ Rogers, Peter (2000). "The Norfolk Inn"". The Book of Hayling Island and Langstone. Halgrove. ISBN 1841140783. ^ "Havant Brewster Sessions". Portsmouth Evening News. 1901-08-31. p. 6. ^ "Harbour fees cut to aid Hayling Ferry service". 8 September 2018. Retrieved 27 January 2019. ^ "Hayling Island's only ferry stops crossings". 31 March 2015. Retrieved 27 January 2019. ^ "Hayling Island ferry revived after fundraising effort". 3 August 2016. Retrieved 27 January 2019. ^ "Public meeting set to discuss Hayling Ferry bus service". Portsmouth: The News. 2017-03-29. Retrieved 2017-04-09. This page was last edited on 27 January 2019, at 06:48 (UTC).